Category: Hikarimono (silver, shiny fish). Season: best from August to November. 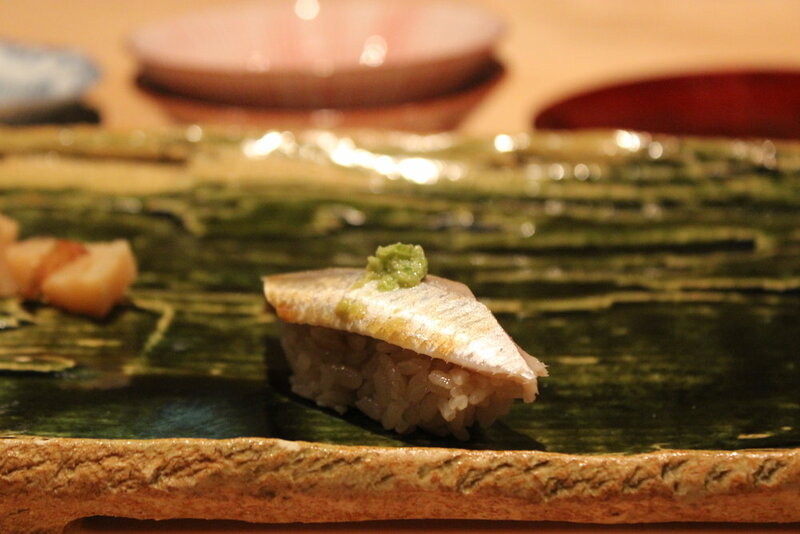 Iwashi is very popular as a nigiri topping these days, but this was not always the case. This fish spoils very quickly due to its very high (omega 3) fat content, so back in the Edo period it was not served as sushi, and was usually grilled. It wasn't until post WWII, when refrigeration became the norm in the fish trade, that people started consuming iwashi as a nigiri tane. Even today, because the fish spoils so quickly, it is rarely served fresh (nama) - the usual preparation involves salting the fish to draw out water, and then marinating it in rice vinegar to preserve it and impart sour flavor as well as a hint of sweetness. As nigiri, iwashi is usually served with a portion of its beautiful silver skin on, and minced ginger, shallots, or other embellishments to help cut through the fat. And the oily fat can be just sublime. When prepared well, the rich omega 3 oils will provide the main flavor profile, but will be perfectly balanced with sweet vinegar flavors from both the marinade and the shari - a really complex, bold piece.